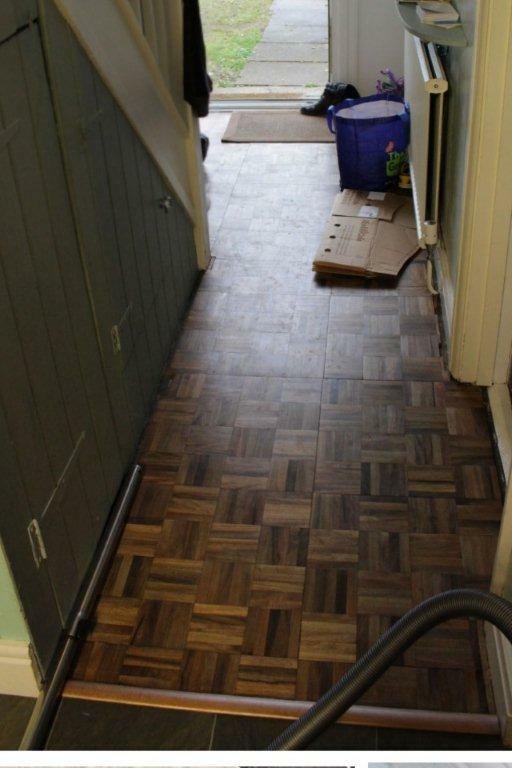 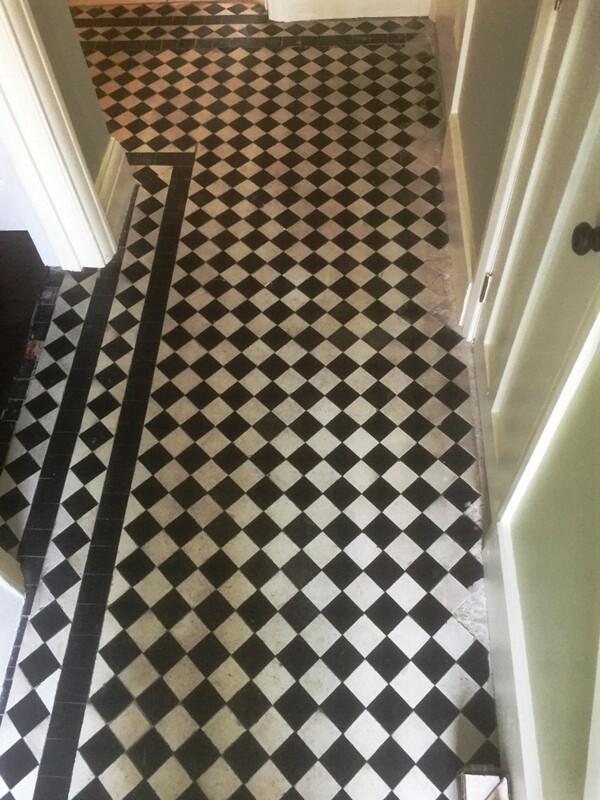 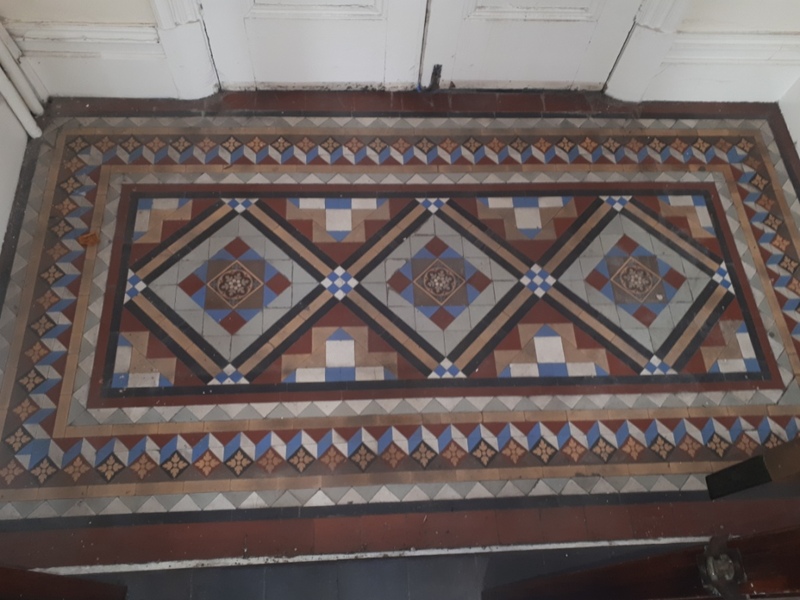 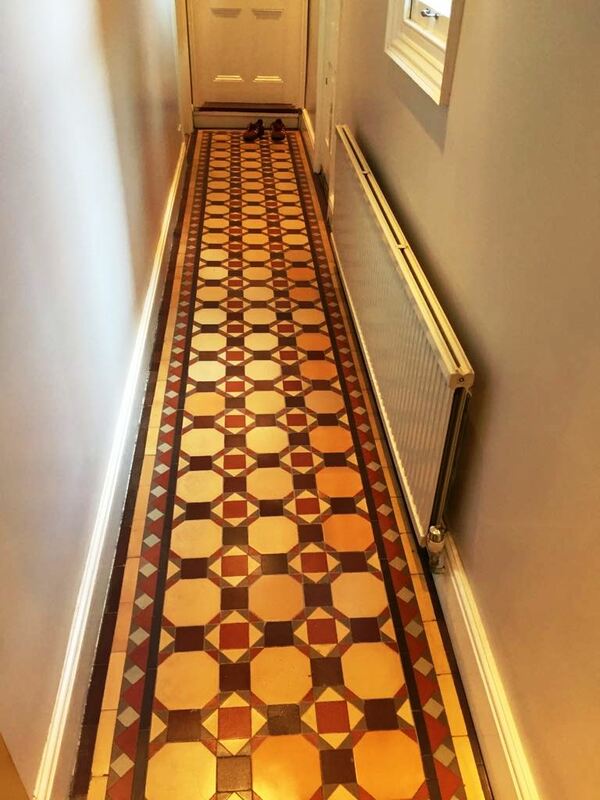 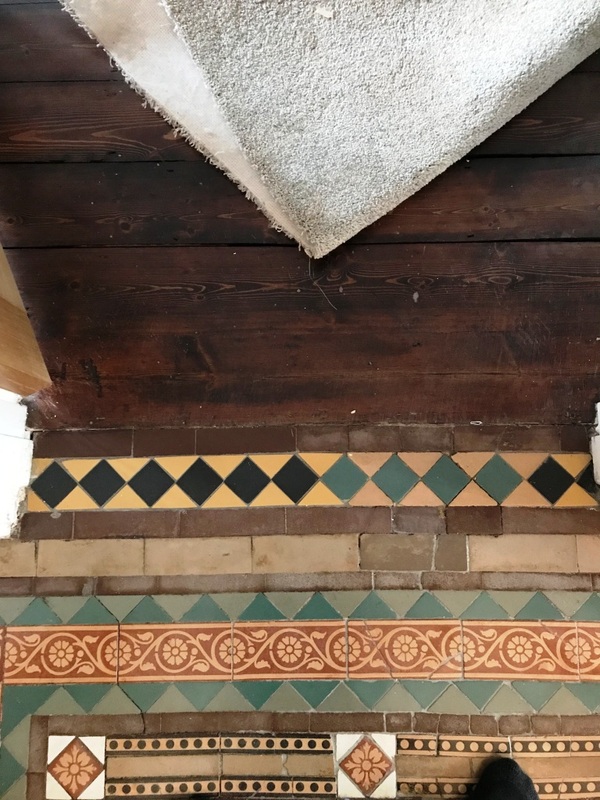 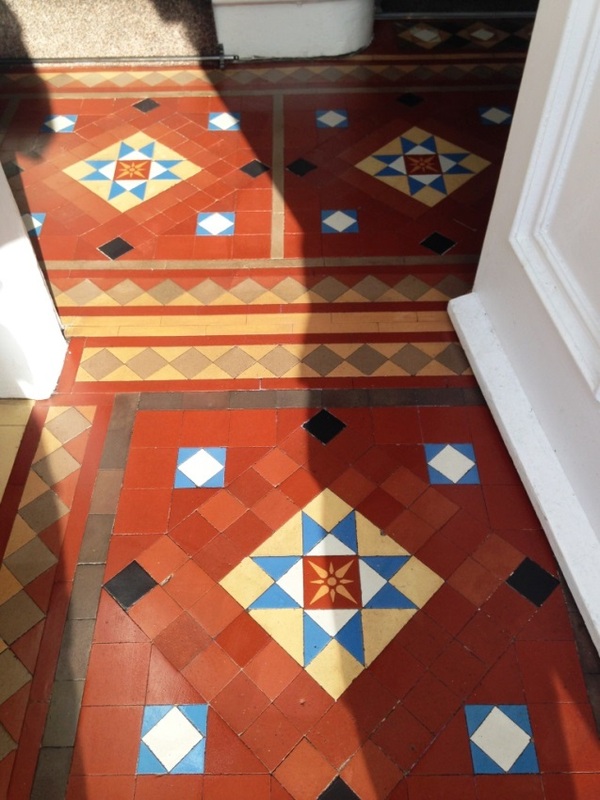 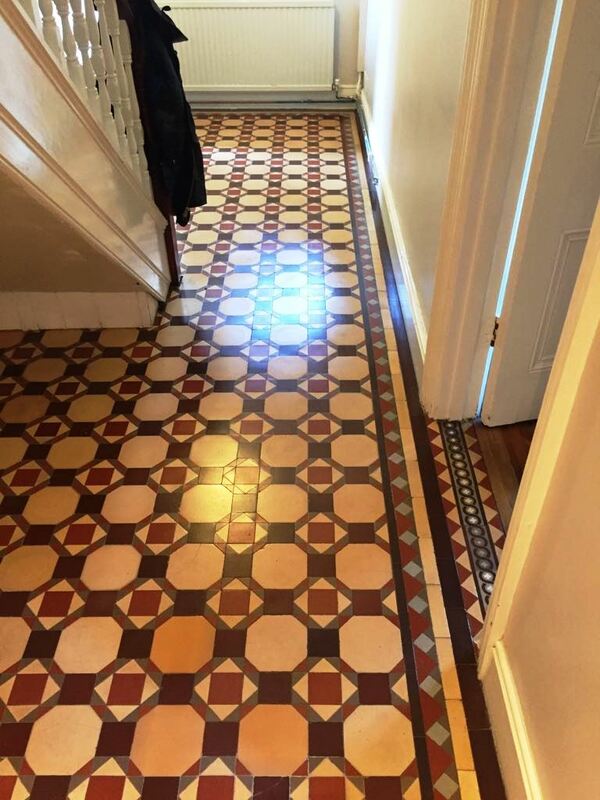 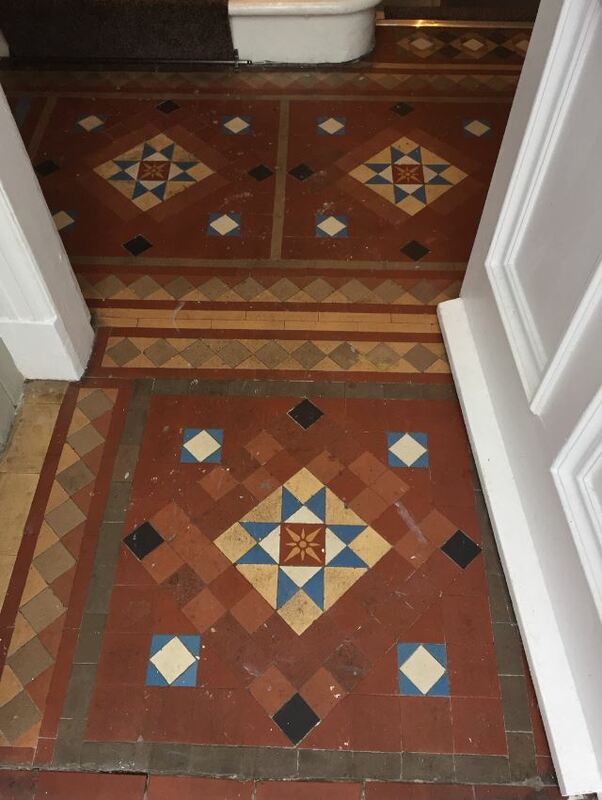 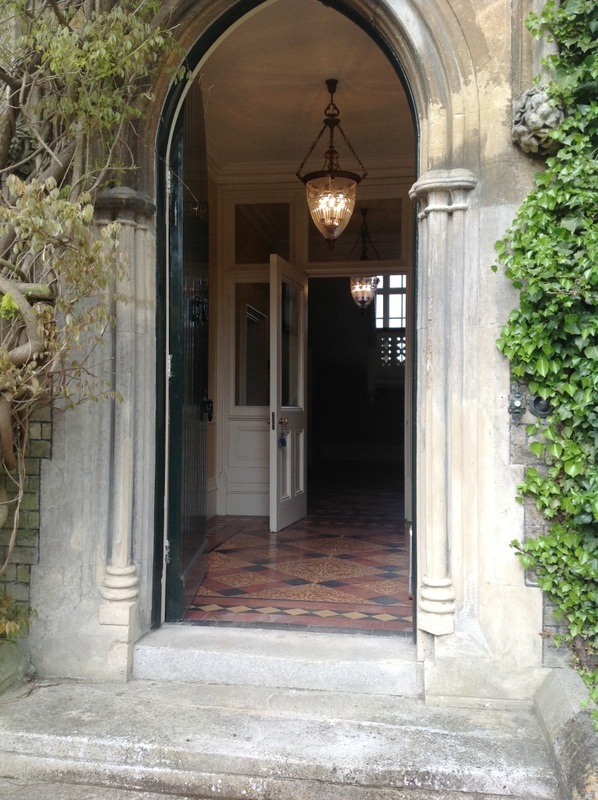 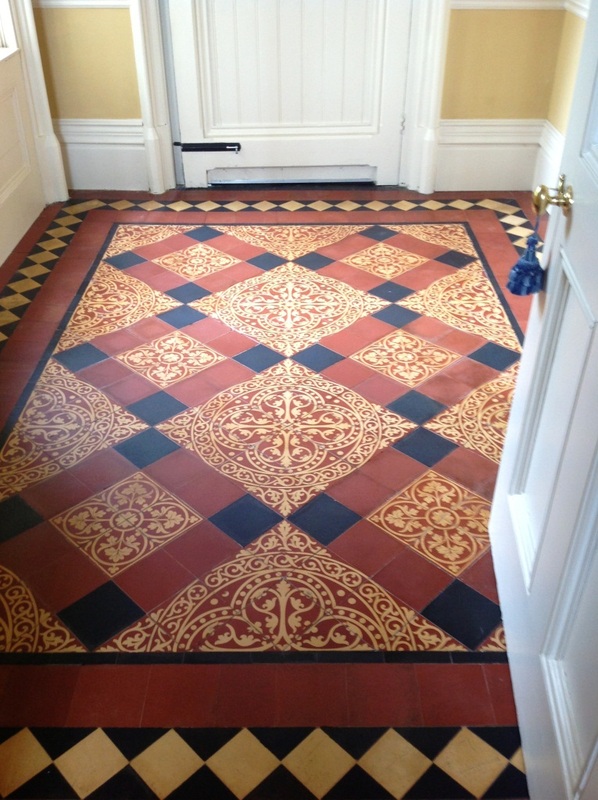 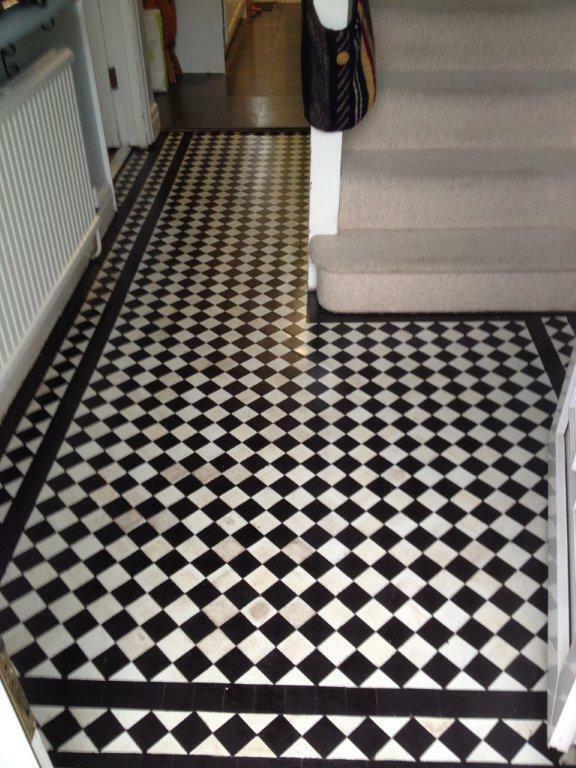 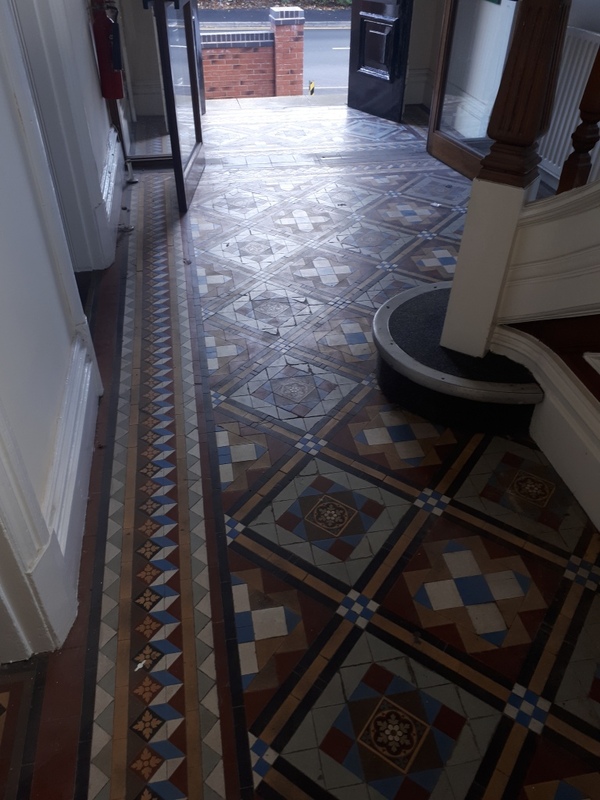 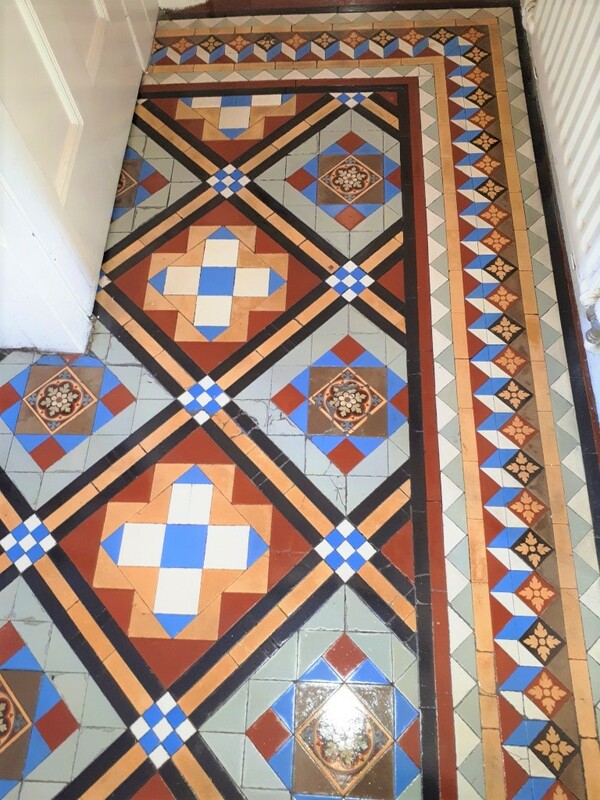 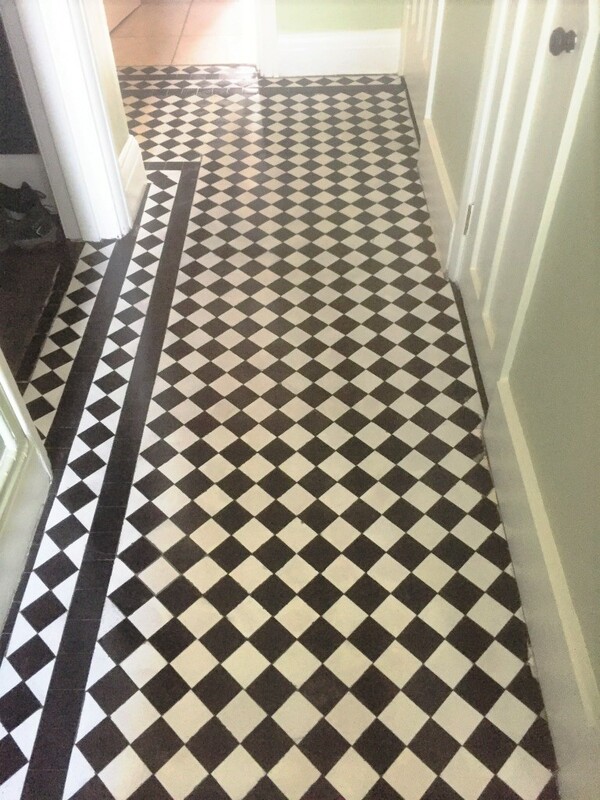 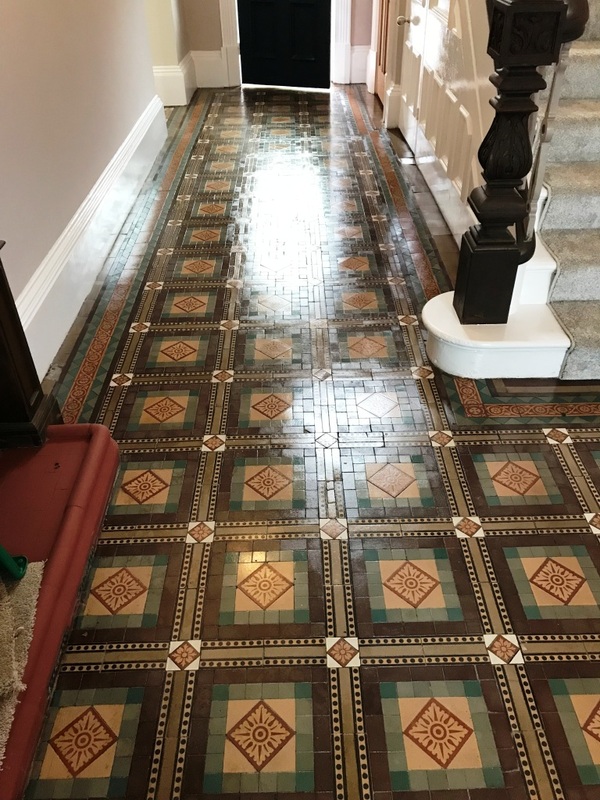 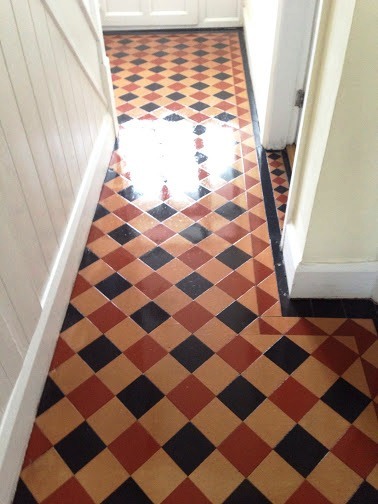 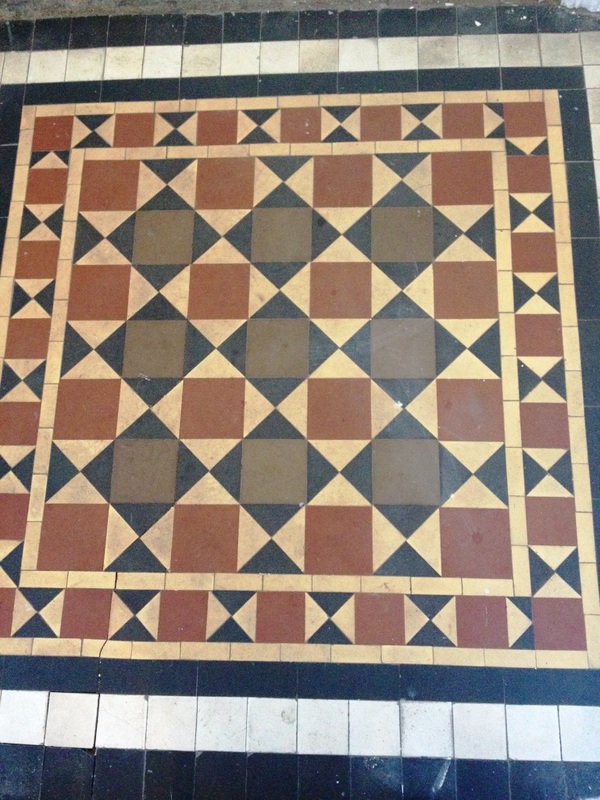 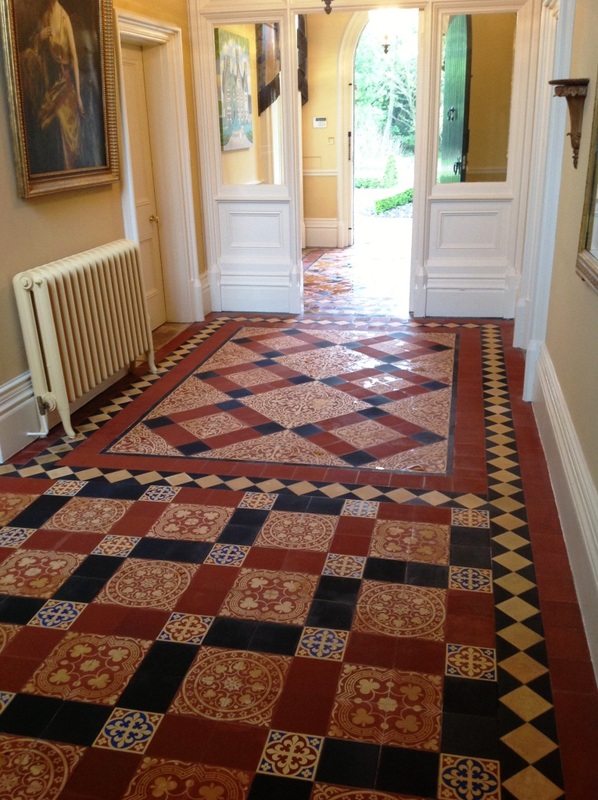 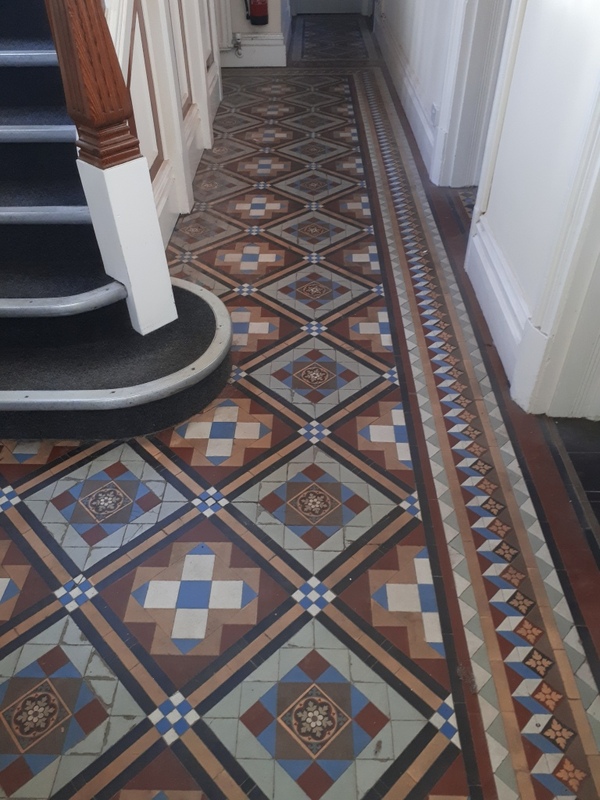 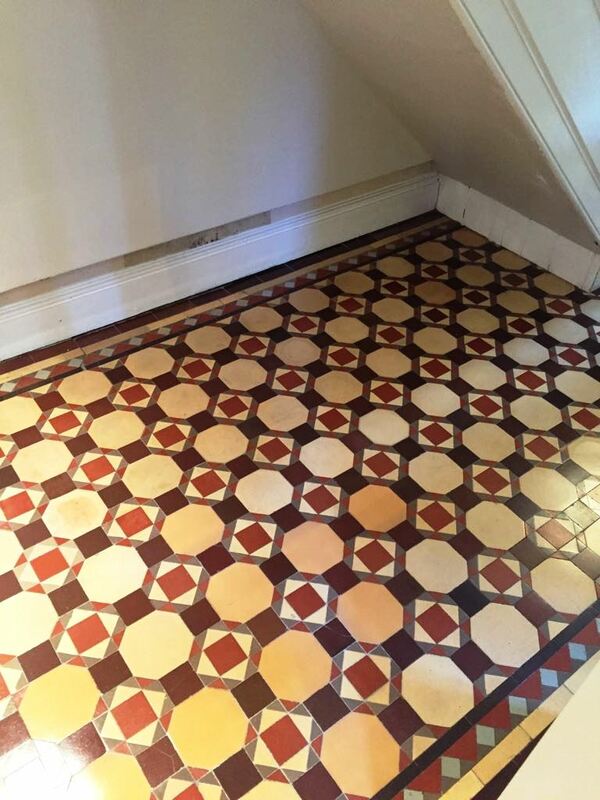 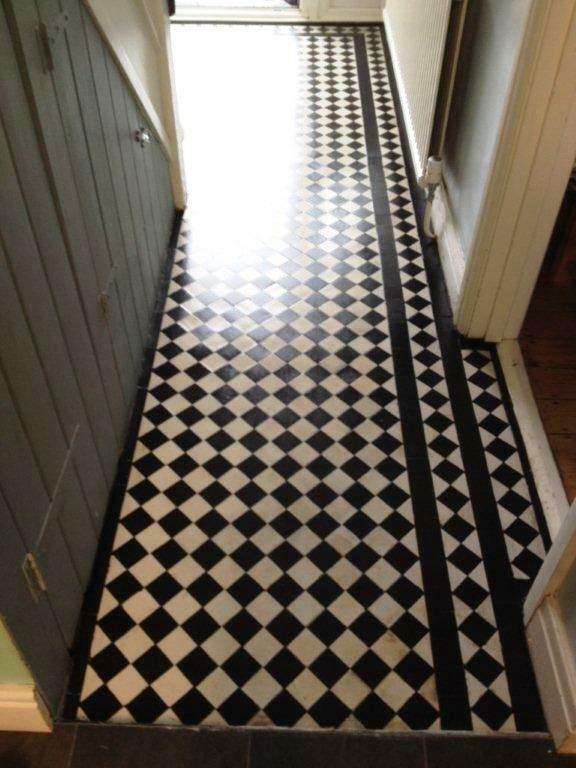 These photographs are from a lovely old period property in the village of Harston near Cambridge which had an original Victorian Tiled floor installed throughout the hallway and stairwell. 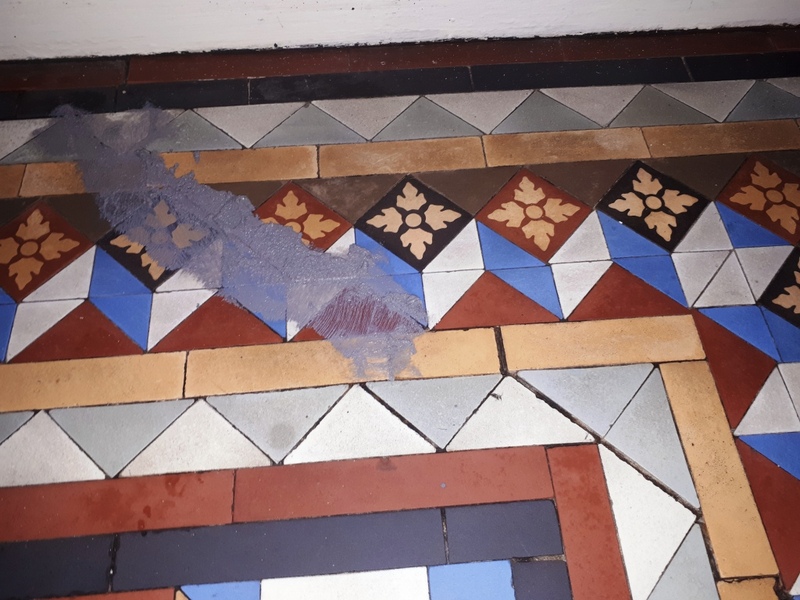 Considering its age the tiles were in a very good condition but they were looking dull and overdue for a deep clean and re-seal. 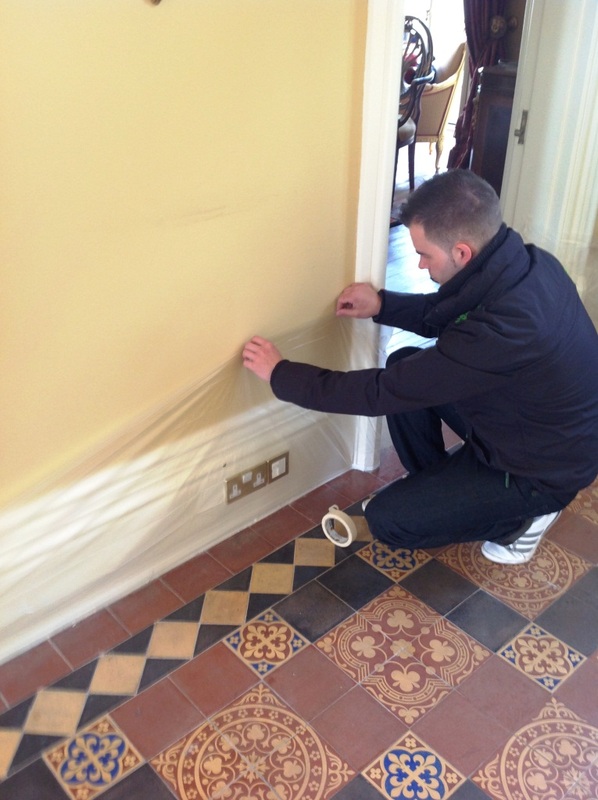 Working in sections the first step was to protect the beautiful skirting boards with clear plastic fixed with decorator’s masking tape. 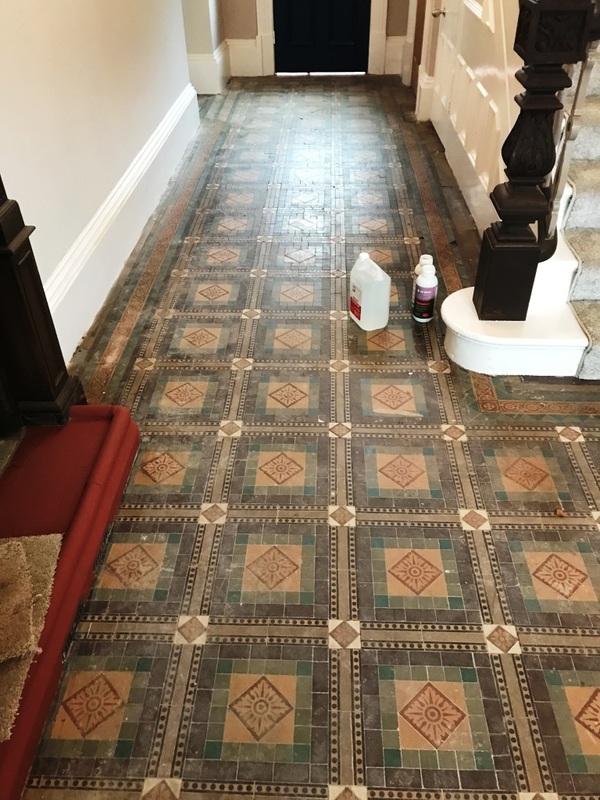 This was followed by applying a dilution of Tile Doctor Pro-Clean and letting it soak into the tile for about 20 minutes before being agitated using a rotary machine fitted with a black scrubbing pad. 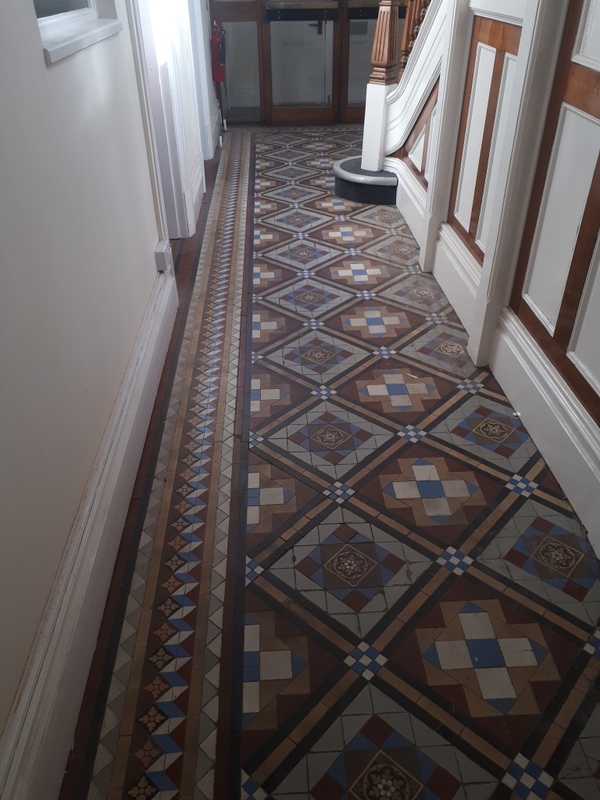 This did a good job of cleaning the floor however there were some stubborn stains that needed further attention so more Pro-Clean was applied and worked in with a stiff hand brush as a steamer was used to help lift the dirt out of the pores in the tile. 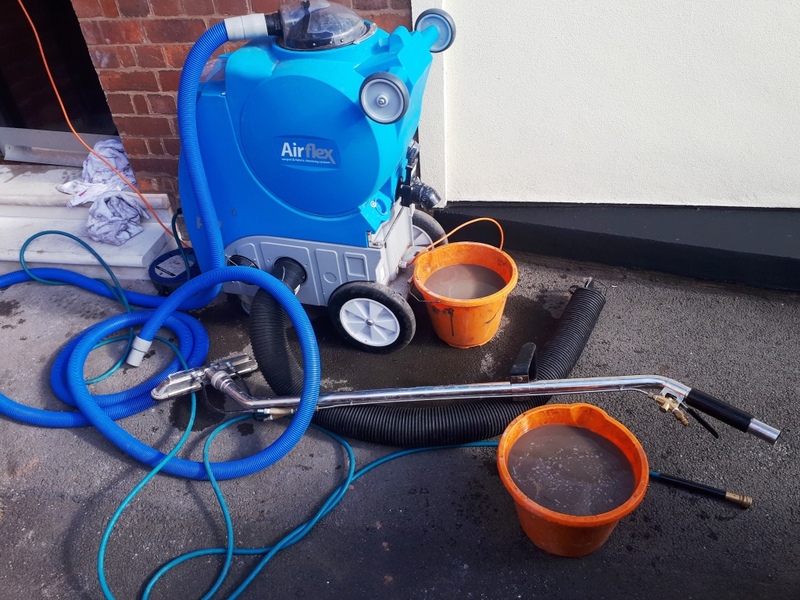 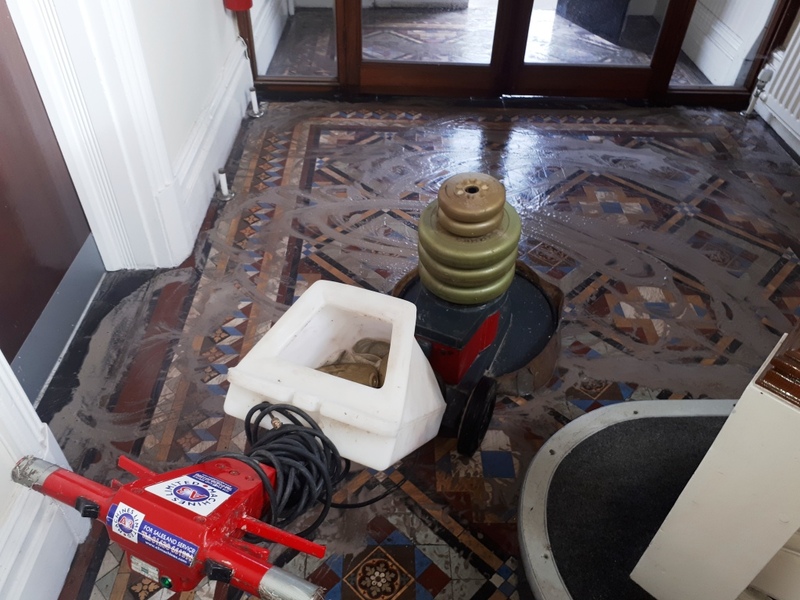 Once we were happy with the floor the soiled cleaning fluid was removed from the floor using a spinner tool which applies hot water under pressure effectively rinsing the floor whilst removing the water at the same time with suction. 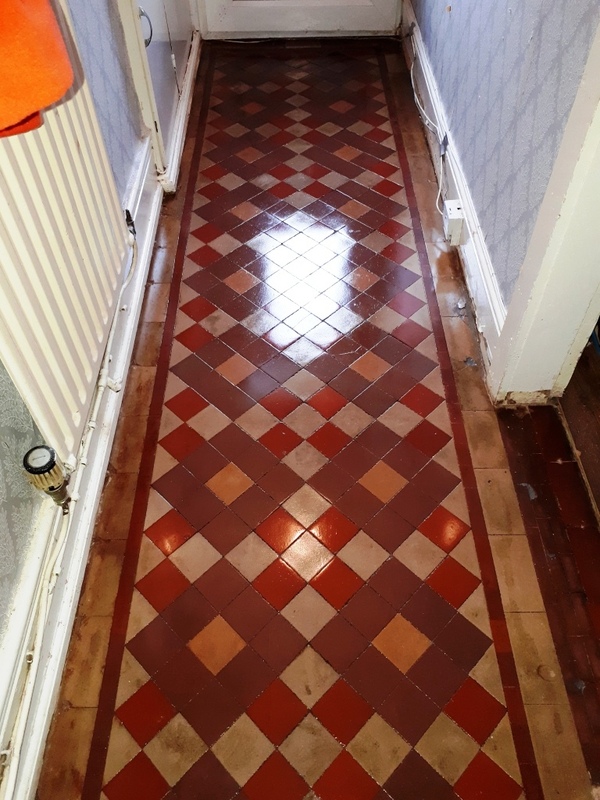 The floor was left to dry assisted with air blowers before moving on to sealing with Tile Doctor Seal and Go which is a recommended sealer for Victorian floor tiles that provides on-going stain protection as well as adding a nice subtle shine to the floor. 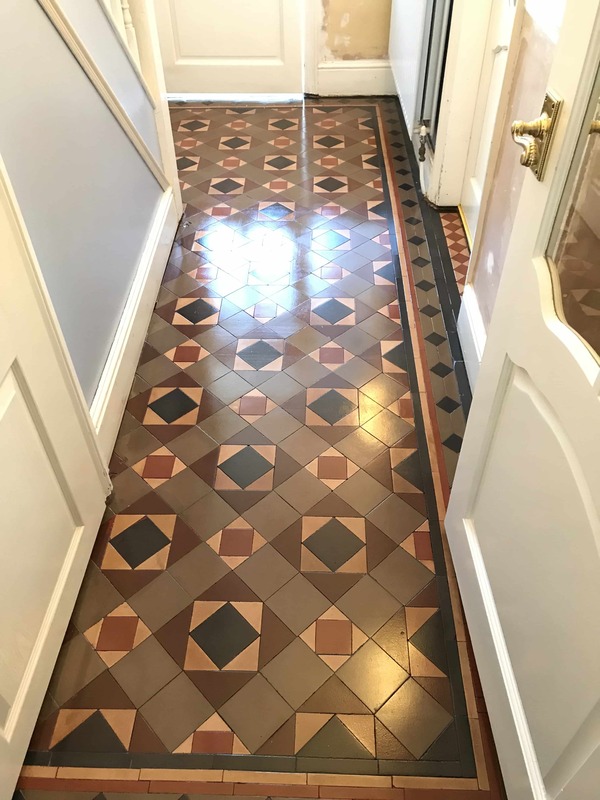 The customer was really pleased with the results and even asked us back to do the slate tiles in the kitchen something I will no doubt write about in a later post. 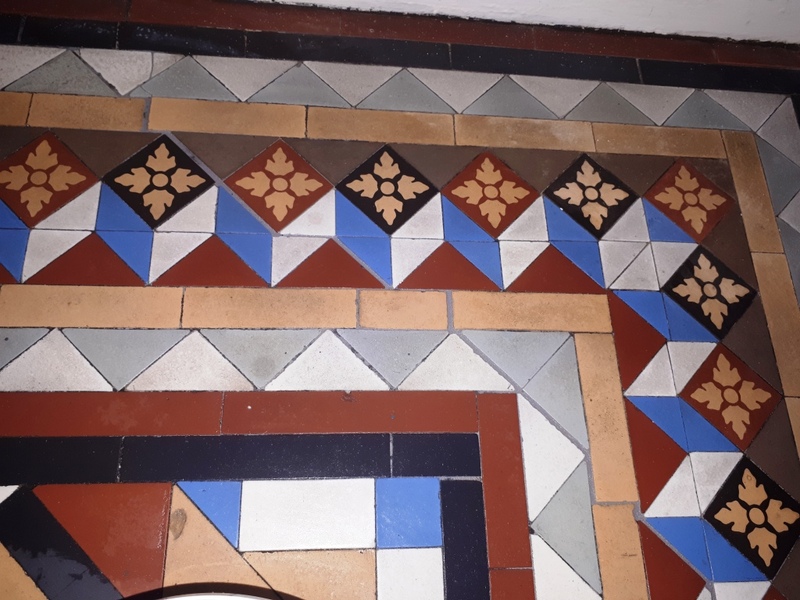 The owner of this Victorian tiled bathroom floor in Horncastle had tried scrubbing and scraping these tiles will little to show for it, in the end after spending hours on this cold floor and trying lots of different products he was fed up and it still looked less than satisfactory. 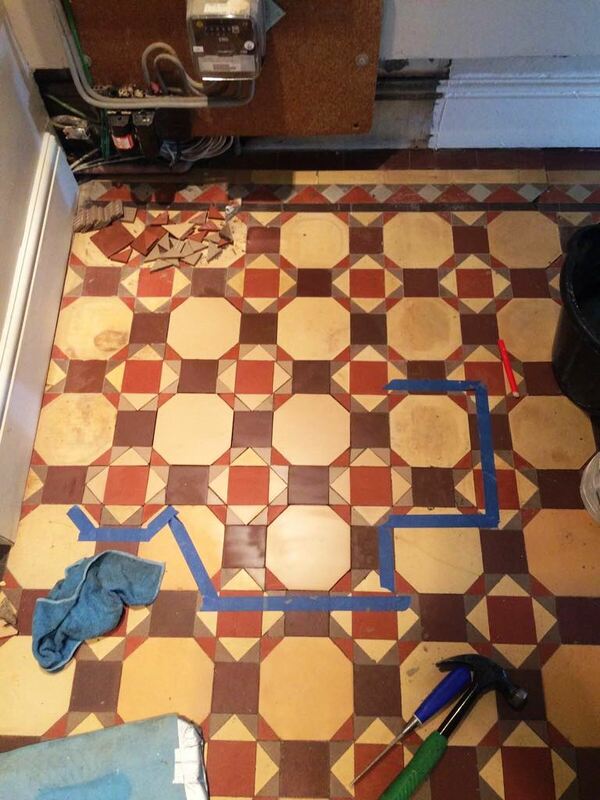 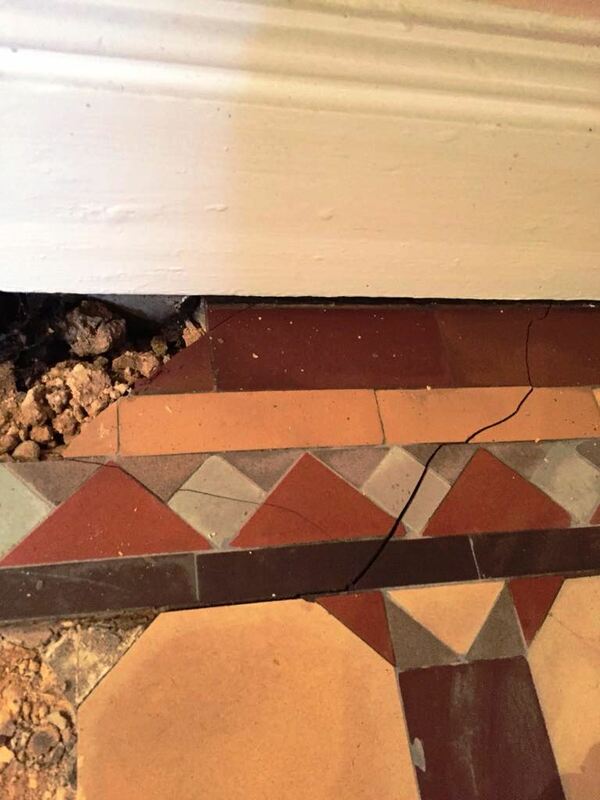 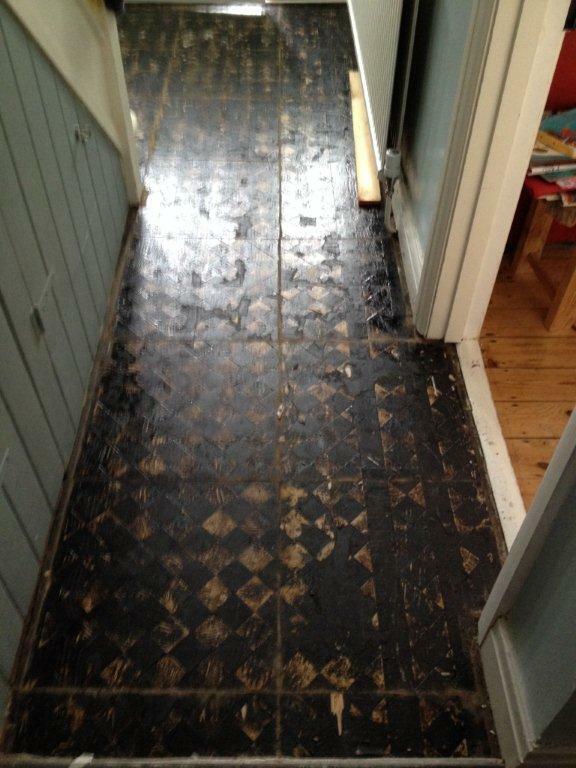 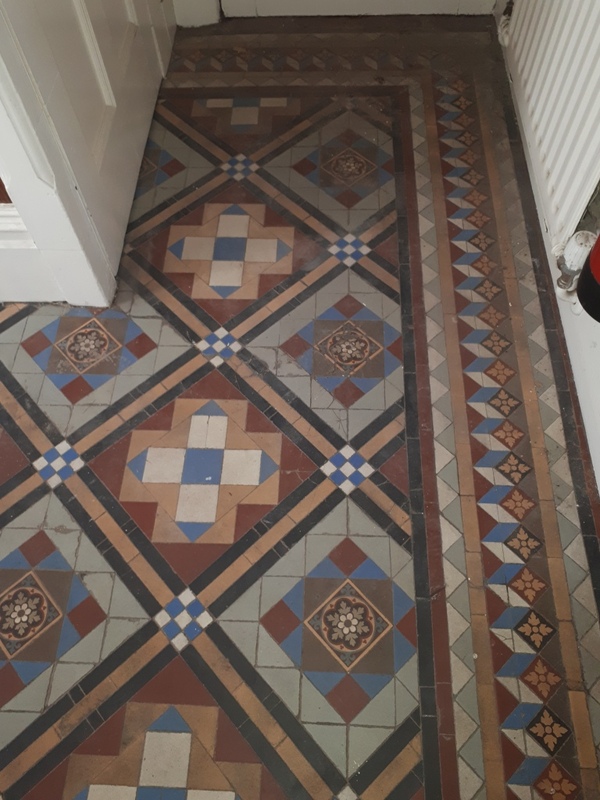 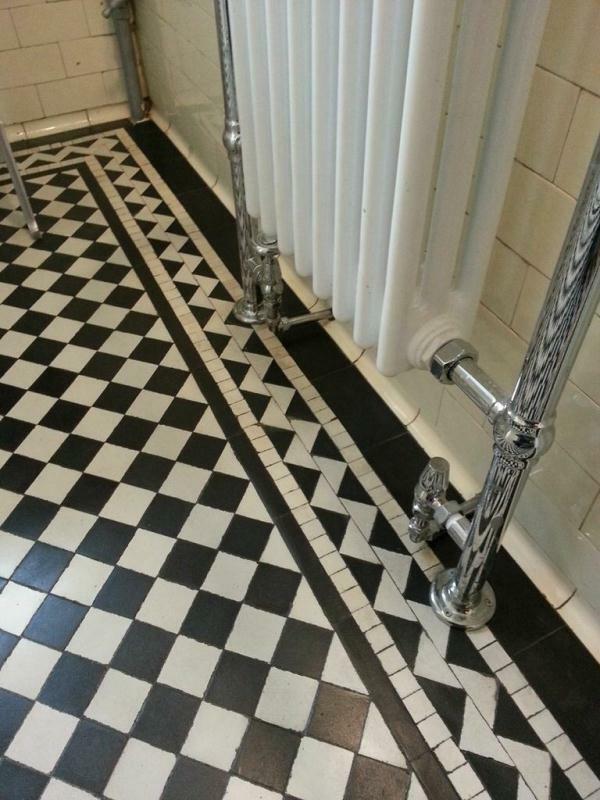 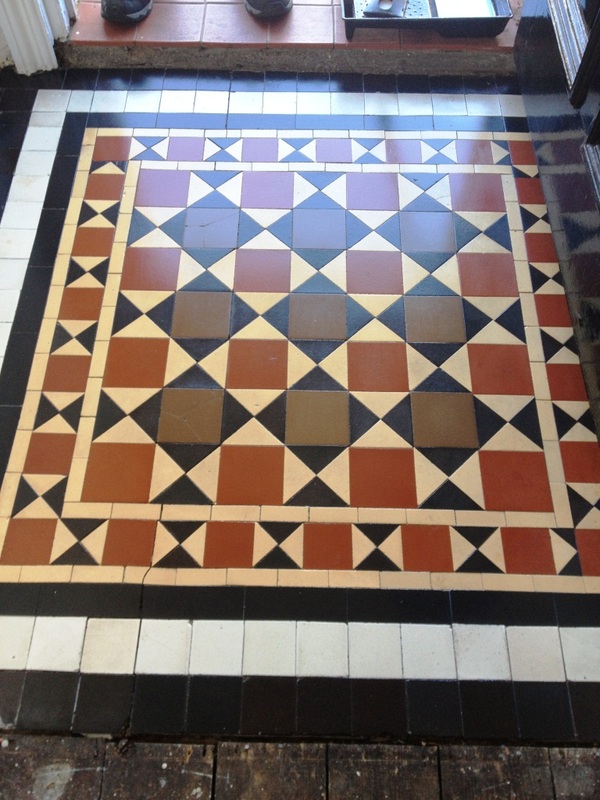 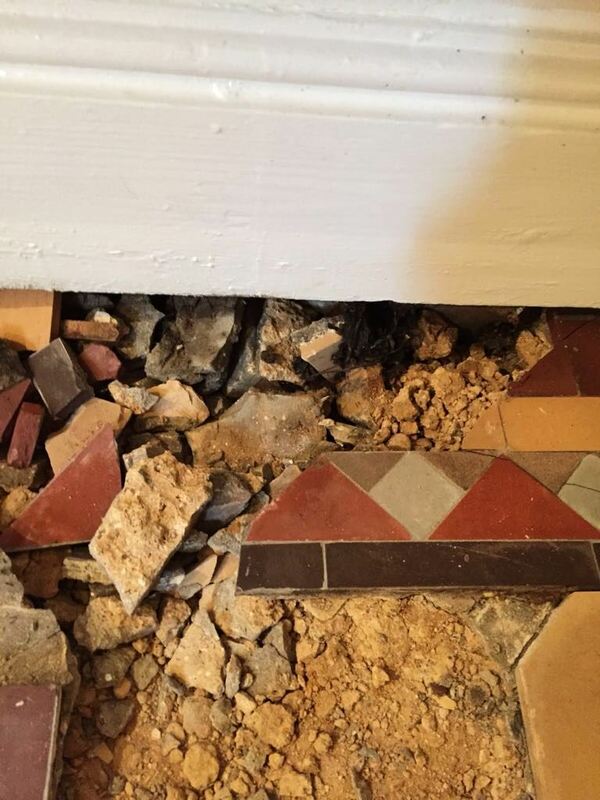 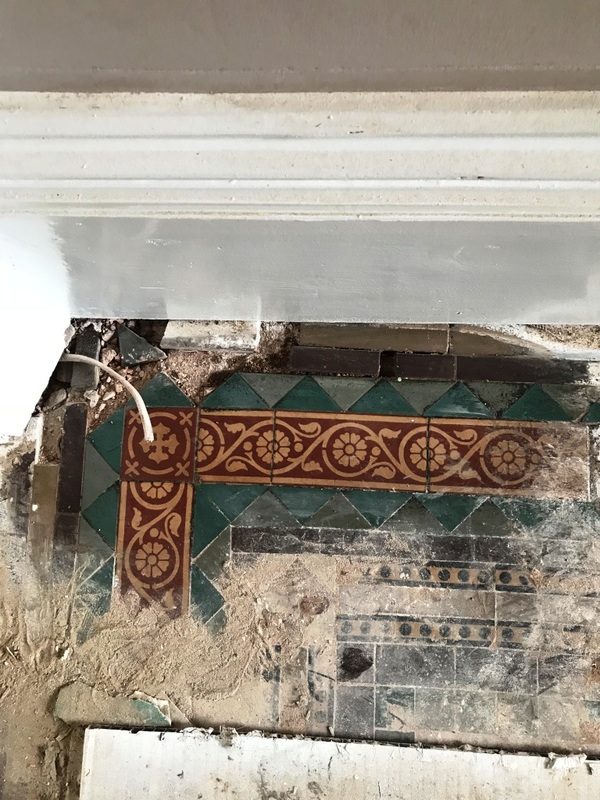 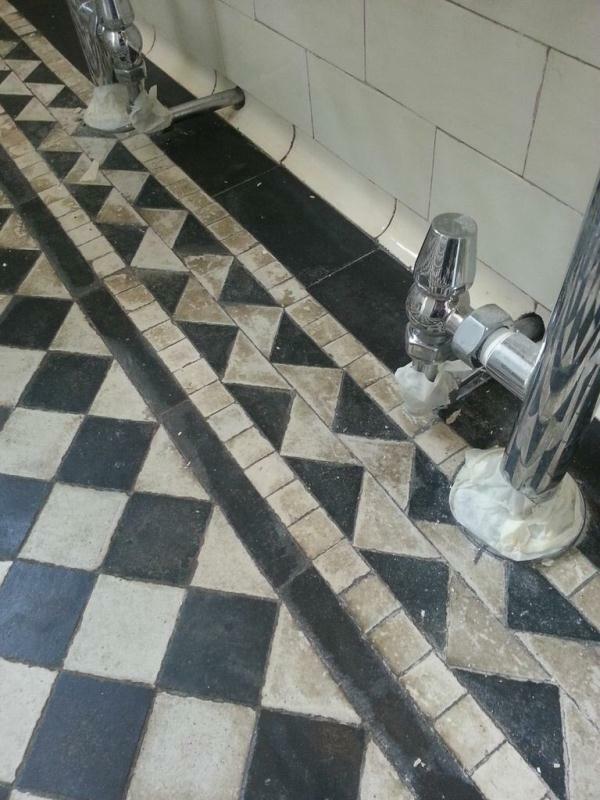 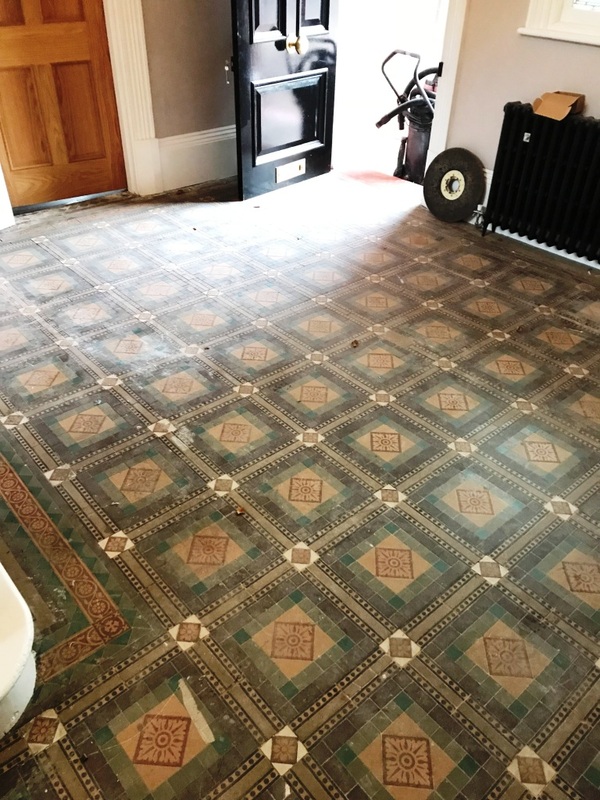 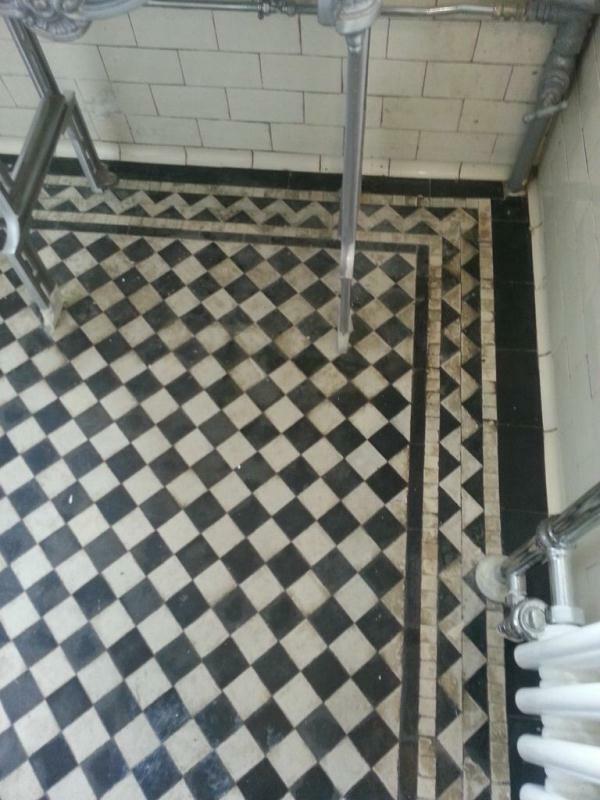 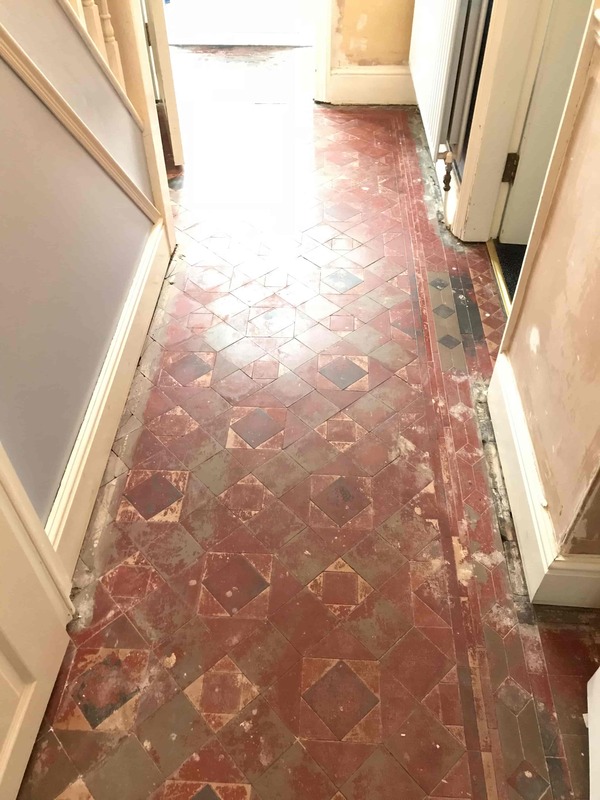 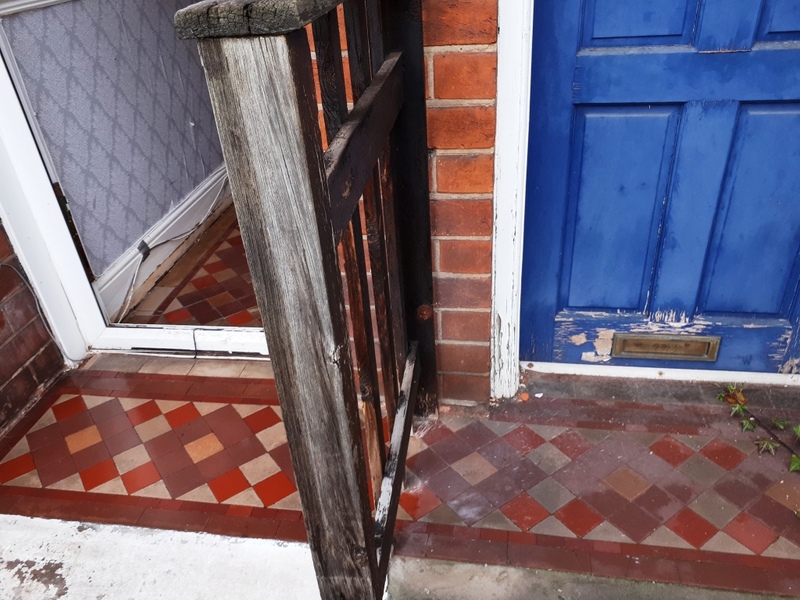 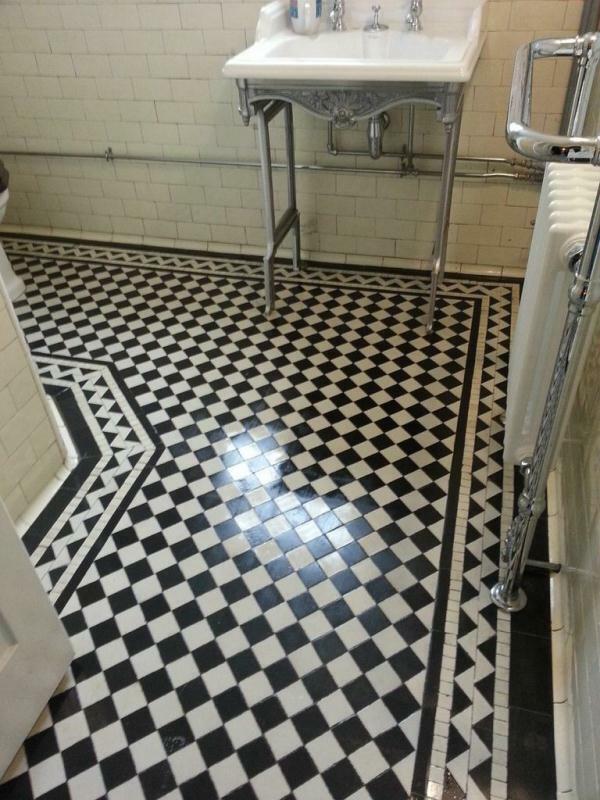 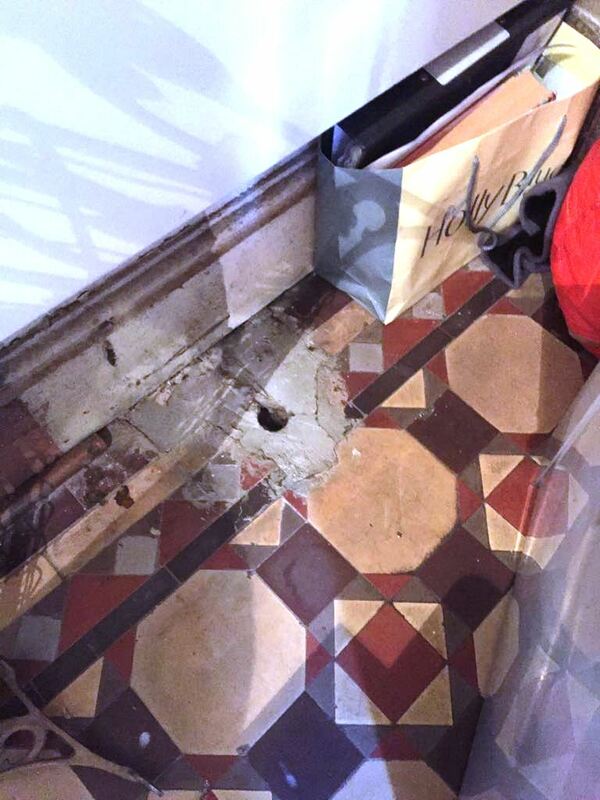 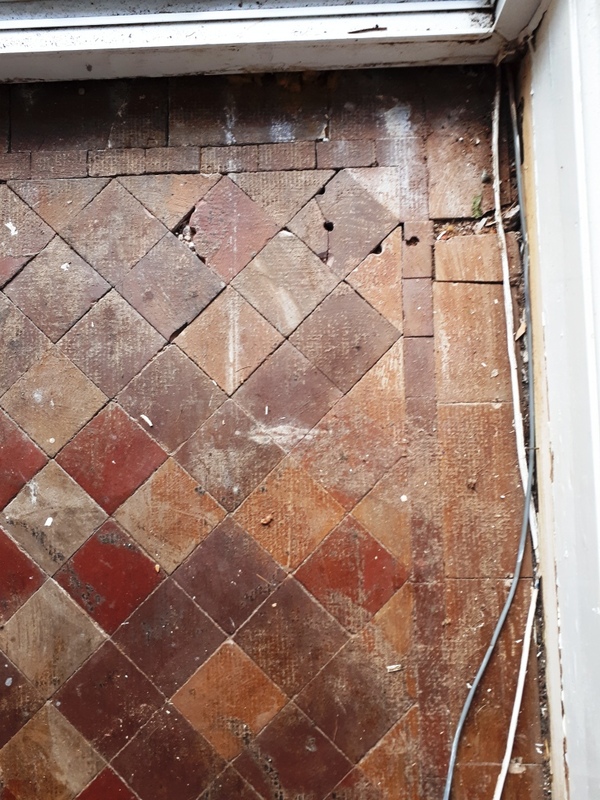 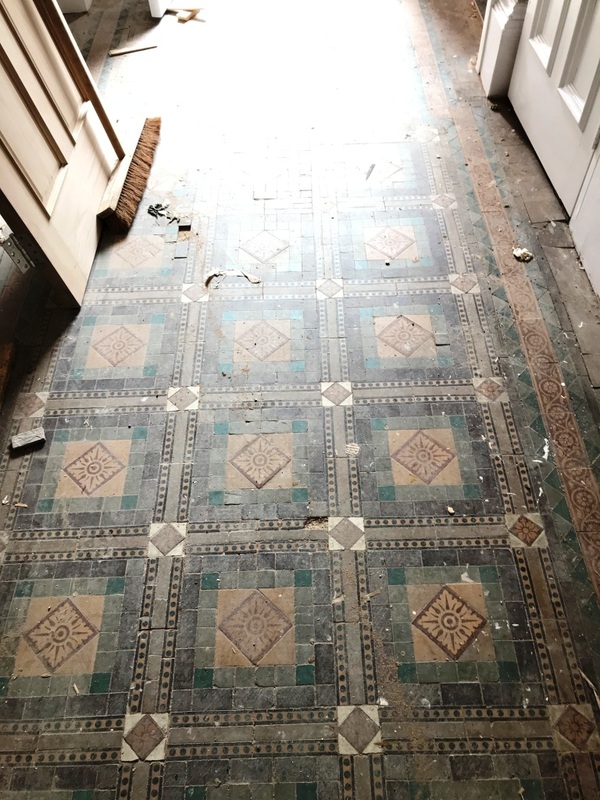 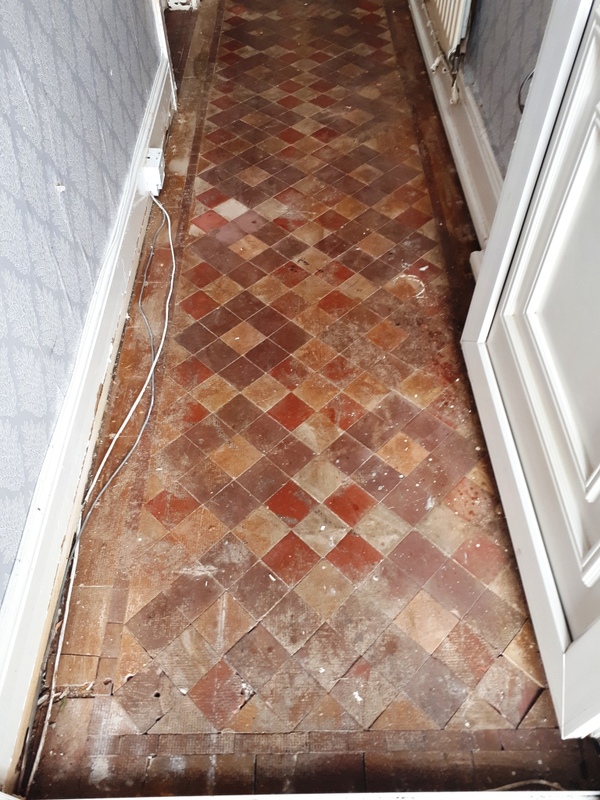 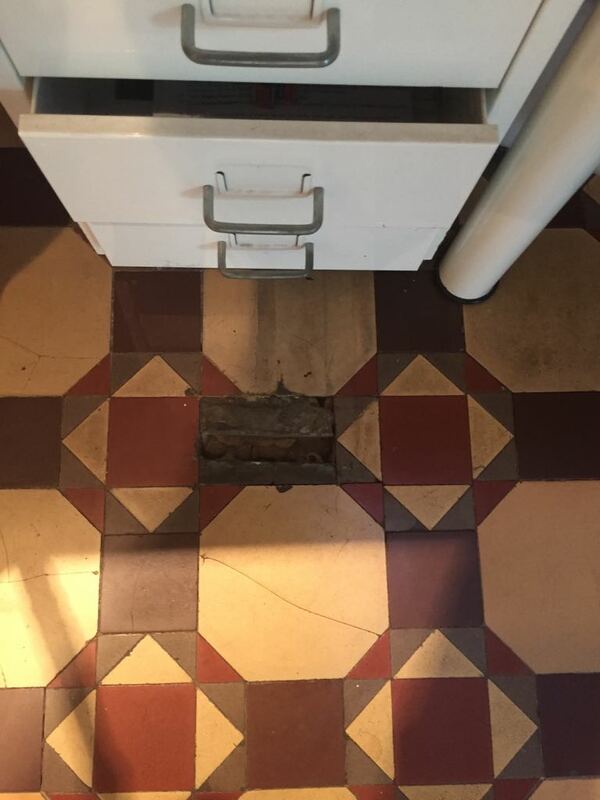 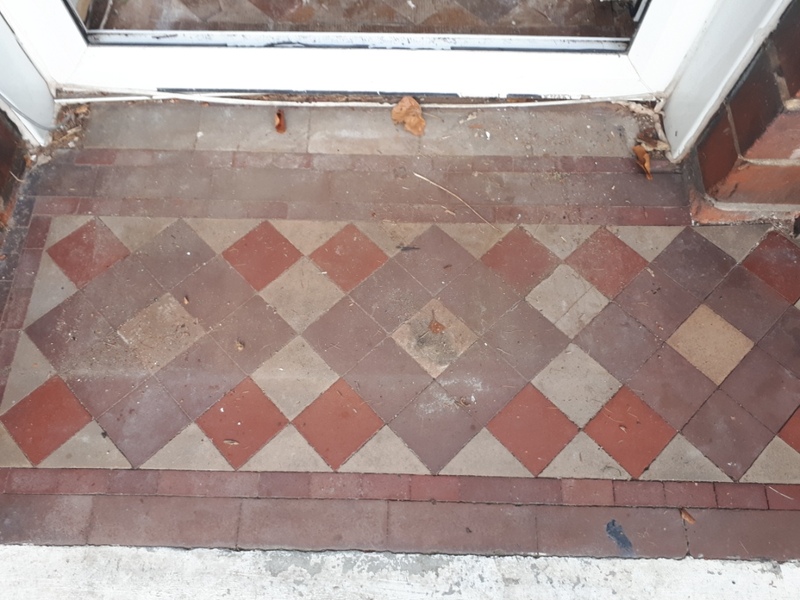 The tiles were very old and dirty and had remnants of glue stuck around the edges indicating they had previously been covered by something else such as lino, fortunately Victorian tiles are our bread and butter and we have managed to restore tiles in a much worse state than this. 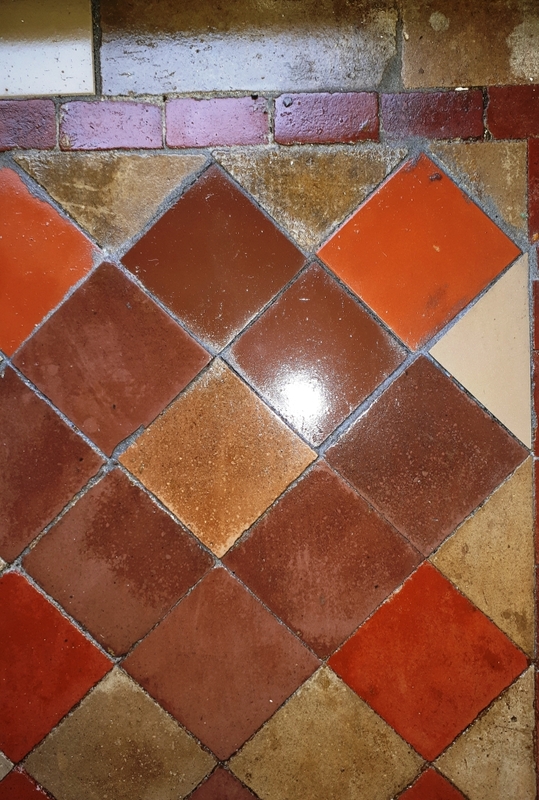 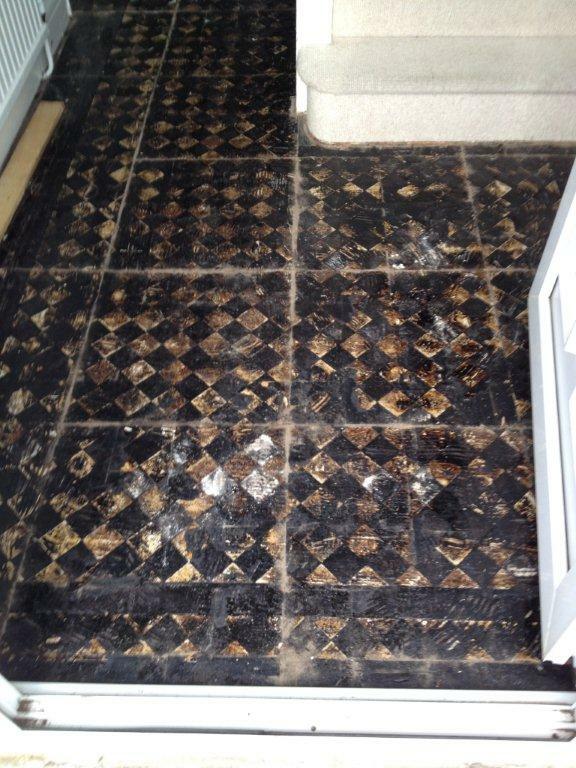 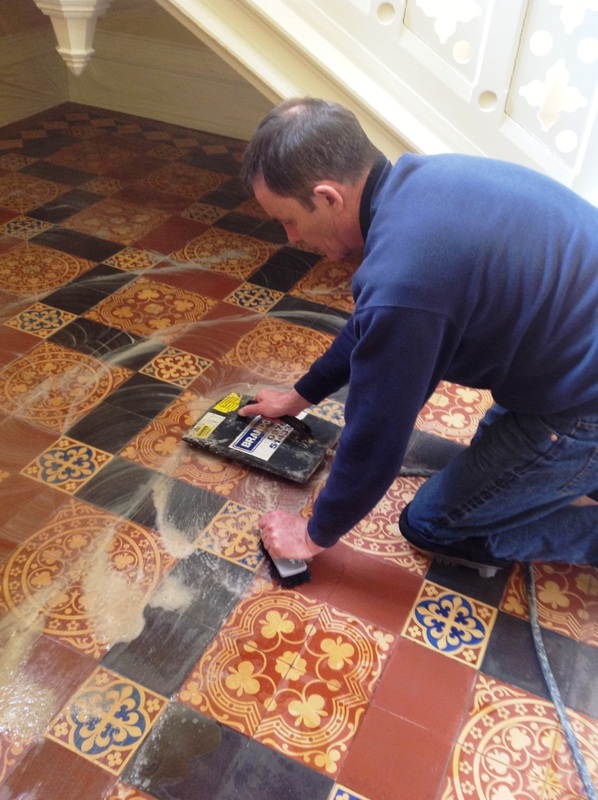 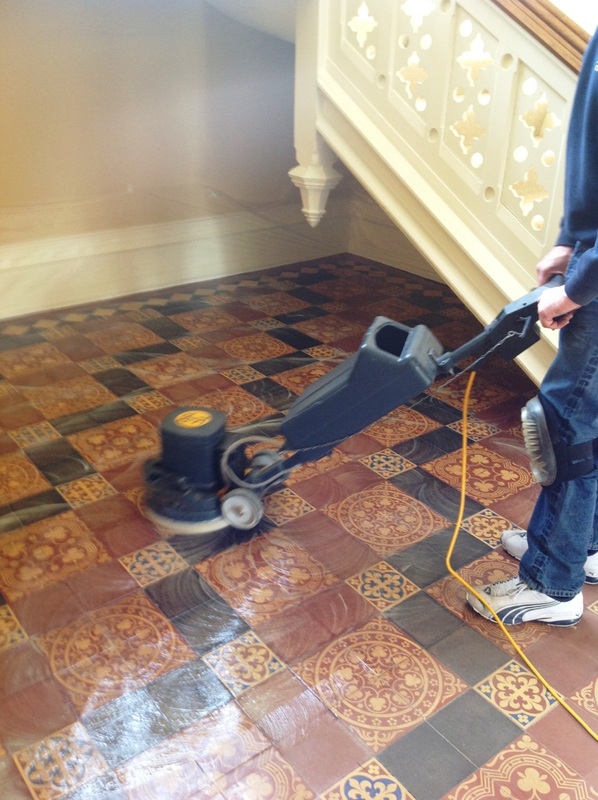 We set about cleaning the tile using Tile Doctor Remove and Go which is a strong coatings remover which is ideal for removing old sealers and adhesive products. 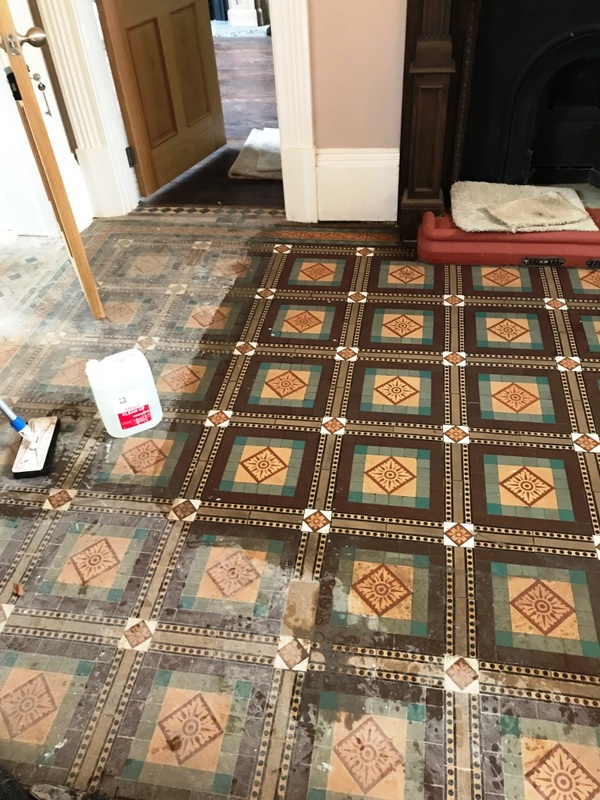 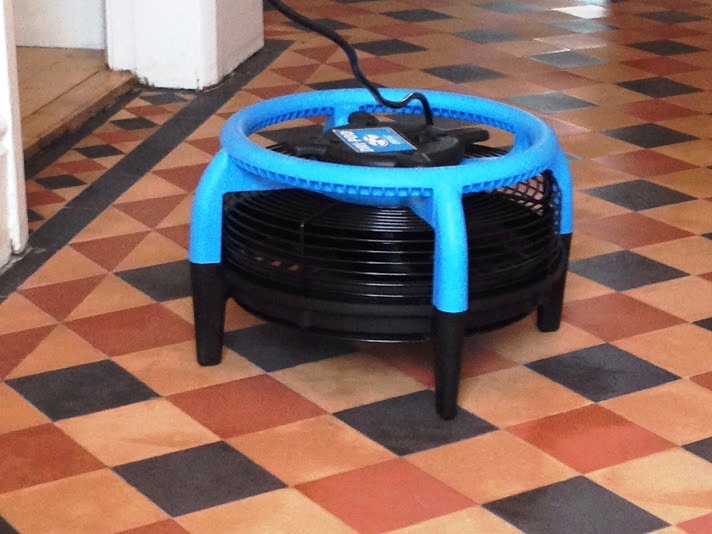 It was left it to dwell on the floor for a while in order to give it chance to soak into the tile and get to work on the glue before being agitated using a rotary machine fitted with a black scrubbing pad. 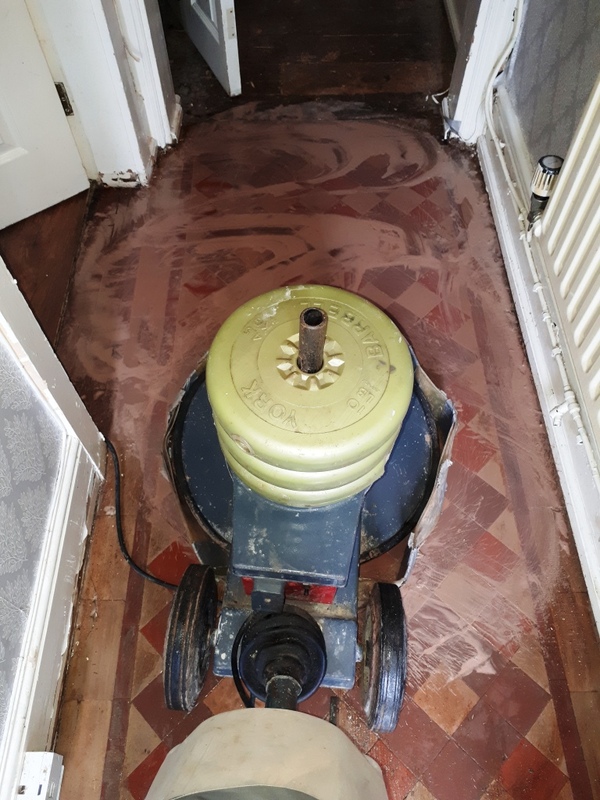 The soiled solution was then removed using a wet vacuum and the floor given a good rinse with clean water again using the wet vacuum to get the floor dry. 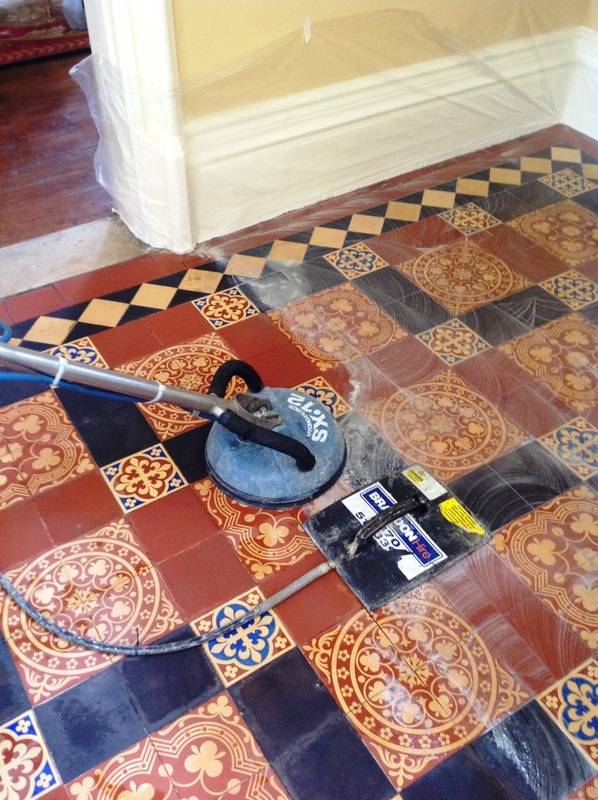 This process tackled the glue but the tiles were still in need of a good clean so Tile Doctor Pro-Clean which is a strong alkaline cleaning product safe to use on tile and stone was applied; this was left to dwell and then scrubbed into the tiles to get a really deep clean, stiff brushes were used along the grout lines to get them clean as well and then the floor was given a thorough rinse to neutralise the tile and remove any trace of cleaning products. 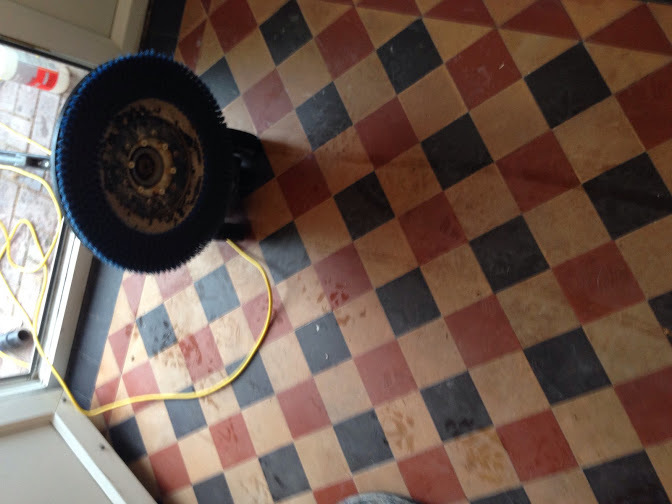 The next step was to seal the floor, however the tiles need to be dry before you can do this so we got our Turbo drying system out of the van, switched it on and it soon had the floor dry. 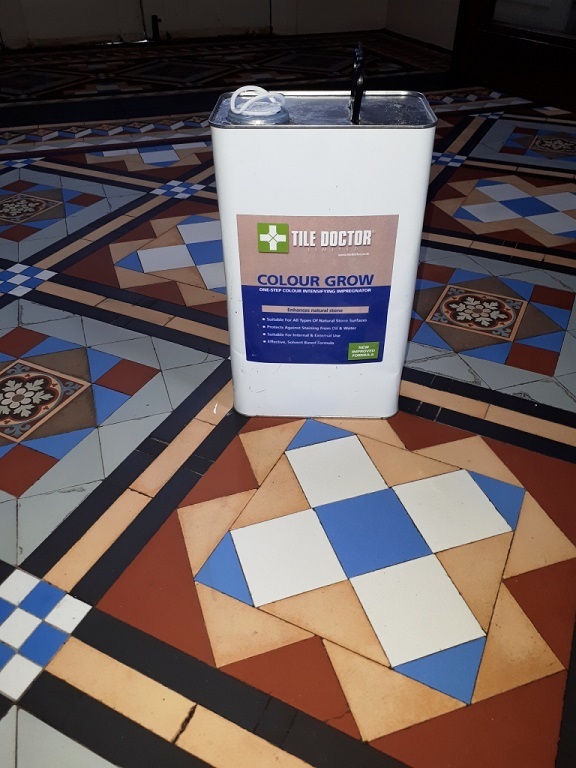 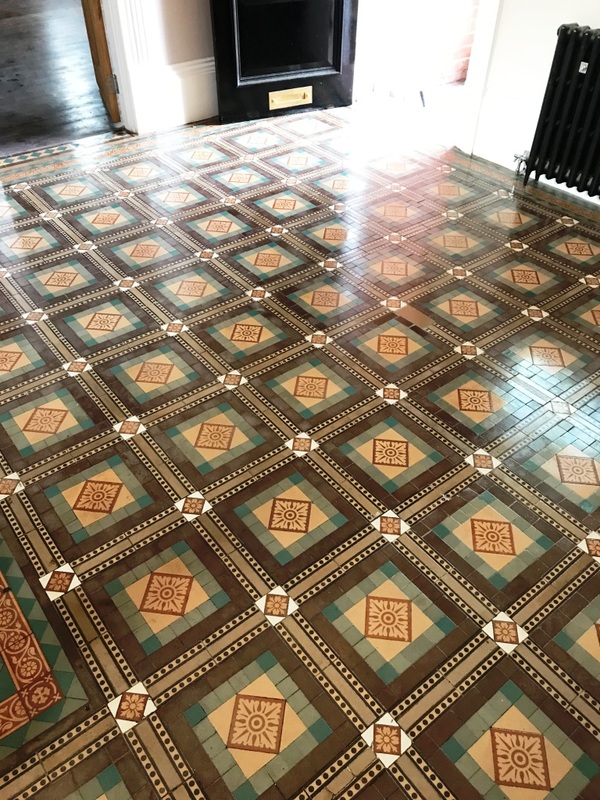 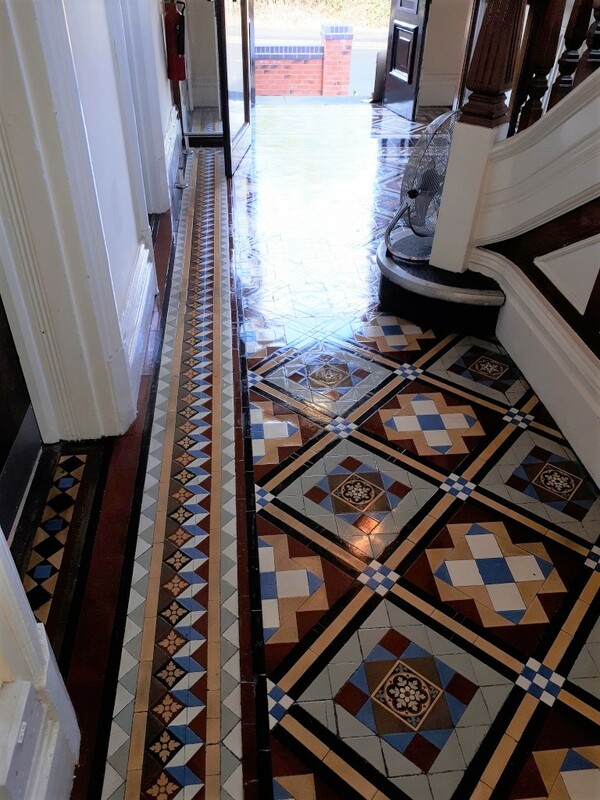 Four coats of Tile Doctor Seal and Go were applied to the floor allowing twenty minutes to dry between coats; this particular sealer is recommended for Victorian tiles and does a great job of adding a nice sheen to the floor as well as adding stain protection. 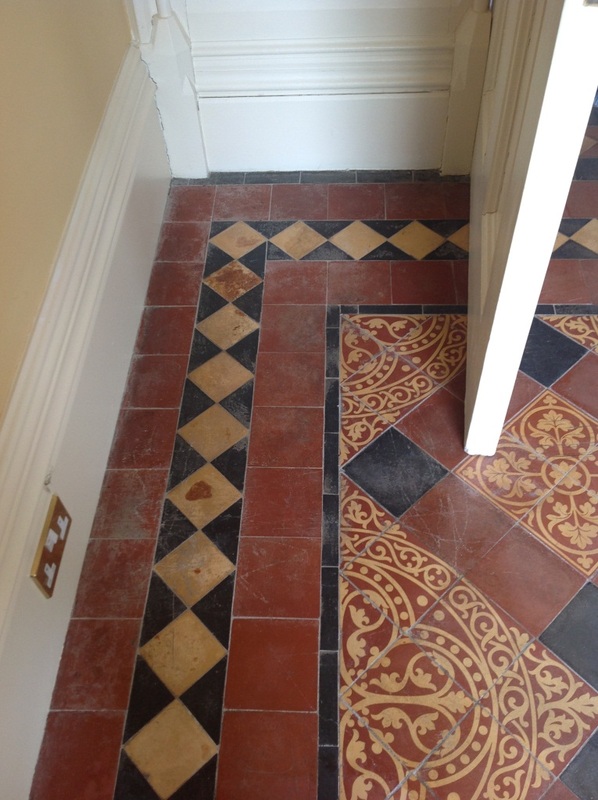 We managed to complete the work in a single day and the owner was absolutely delighted by the results.